A European native, white clover is a perennial legume and one of the most widely distributed legumes in the world. 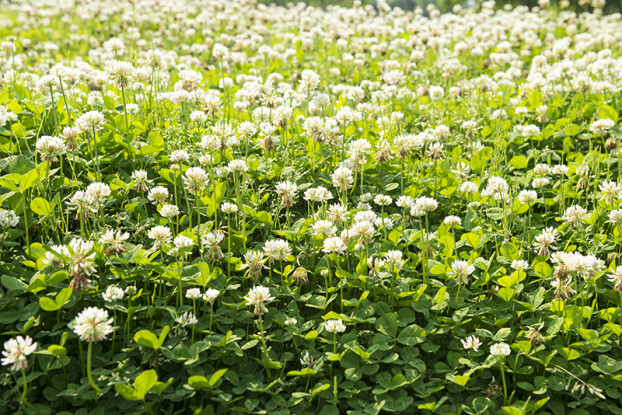 A very desirable component in pastures, white clover is known for its nitrogen fixing abilities and acts as a natural fertilizer for surrounding grasses. Grows up to a foot tall and has a spreading growth habit. Tolerant of a wide range of soil conditions and climates, but prefers cool moist areas. Highly palatable and nutritious for all types of livestock, and an important plant for honey bees. It can be grown without irrigation in areas receiving at least 18 inches of rain annually.